Earlier today, we told you that AT&T would not release the newly announced LG G7 ThinQ, being the only major US carrier to do so. Instead, AT&T plans to launch an exclusive LG smartphone sometime "this summer." While AT&T didn't provide any details on its mysterious upcoming phone, this could be the unannounced LG V35 ThinQ. We first heard about the V35 ThinQ in April, and now, thanks to Android Headlines, we have a couple of renders that allow us to take a look at it. As you'll certainly notice, the home screen of the LG V35 ThinQ shows that the phone is registered on AT&T's network. Design-wise, the V35 ThinQ appears to be indistinguishable from the LG V30S ThinQ (which is already available for pre-order in the US, though only unlocked). It's said that the V35 has the same dual rear camera of the V30S ThinQ, and a similar 6-inch Quad HD+ screen - thus, there's no notch to be seen, unlike on the LG G7 ThinQ. Details on the new handset's processor, RAM, and storage capacity are currently missing. We are definitely expecting the LG V35 ThinQ to be superior to the V30S ThinQ, at least in some regards - otherwise, its existence wouldn't make much sense. 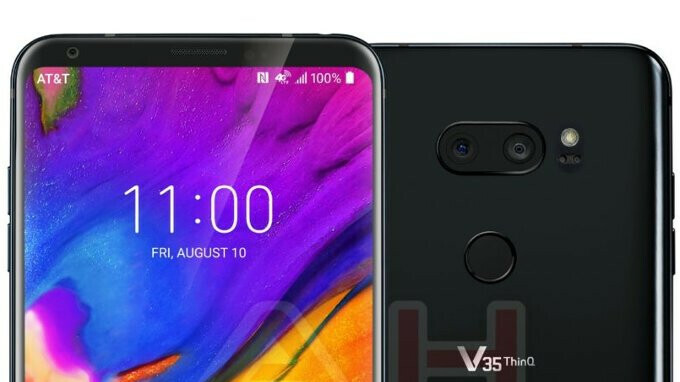 Of course, we won't be able to confirm anything about the V35 until LG officially announces it (possibly in August, judging by the date seen on the phone's home screen). It's funny because the CEO himself literally said earlier this year that they were scaling back and only going to be releasing phones when necessary...so much for that plan. Agreed although it is quite better with the Google camera port actually and gains the ability to do both rear and selfie portrait mode. SD 845 or same 835?